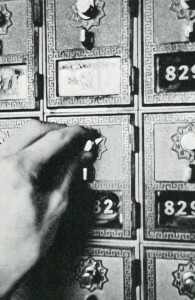 For alumni of a certain age — those of us who came to Wake Forest before cell phones, email and texting — the post office was our link to friends and family back home. The walk to the post office, known as Reynolda Station back then, was a daily ritual, much anticipated, even if often disappointing when you received only “air mail.” Coming up on my 30th reunion, I still remember my box number: 6945. Lisa Ashburn Collins (’84) remembers that daily walk to the post office, too. She grew up in nearby Mount Airy, North Carolina, and visited her parents most weekends. But she still looked forward to opening the brass door to box 9210 to find frequent letters from her mother. Collins saved all those letters: “They were just too sweet to throw away.” Now she has another reminder of a simpler time when getting a letter from back home would lift your spirits. She has a unique piece of Wake Forest history and a keepsake from her college days: the brass door to post office box 9210, the box that was “hers” for four years. The brass door now opens a wooden coin bank on her desk. When the Wake Forest post office moved from its longtime home in Poteat dormitory to the Benson University Center in 2013, new boxes were installed. 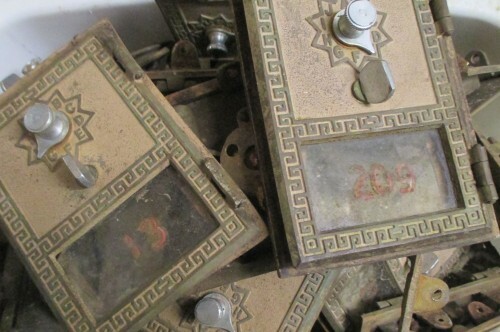 The brass doors to the old boxes — most dating back to 1974 and 1975 — were likely headed to the junk pile. Erroll Hill: He's collected and repurposed old post office box doors since the 1980s. Enter Errol Hill, a woodworker from Collins’ hometown. After years of training school-bus drivers, Hill has a stress free hobby now: repurposing old post office box doors into wooden coin banks. He bought the Wake Forest doors, some 7,000 in all. Oddly enough, they’re not the only Wake Forest post office box doors he has. Years ago, he found a stash of doors manufactured in 1958 in a friend’s backyard junk pile. Those doors have combination locks rather than keyed locks. 1958 doors from the Wake Forest post office. 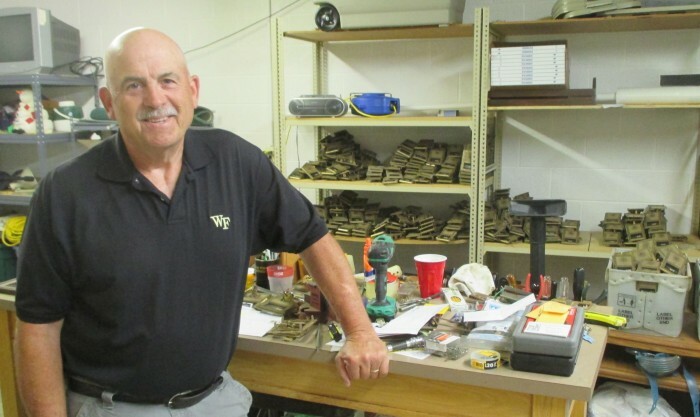 Chances are good he has your box door amidst the piles and piles of doors spilling off shelves and filling storage tubs in his basement workshop. He usually doesn’t clean the doors; most alumni prefer the “aged” look. He has three or four keys for most every door, some 30,000 total, hanging in two large cabinets. Ernie Accorsi (’63) has a story behind his post office box that in a round about way ties into Wake Forest’s appearance in the 1962 Final Four basketball tournament. In the Sweet 16 that year, Wake Forest trailed St. Joseph’s by two with 13 seconds remaining before St. Joe’s Bill Hoy missed the front end of a one-and-one free throw attempt. Billy Packer (’63) scored with five seconds left to tie the game at the end of regulation, and Wake Forest won by 11 in overtime. Wake Forest went on to beat Villanova in the Elite 8 before losing to Ohio State in the Final Four. Banks made by Erroll Hill using old post office box doors. The following year, St. Joseph’s and Wake Forest met in the old Memorial Coliseum. 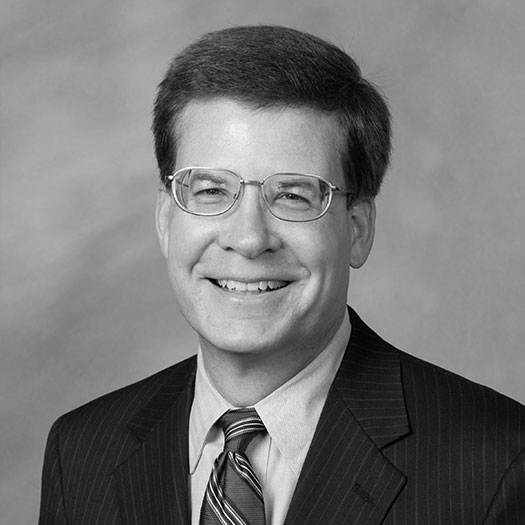 Wake Forest students greeted Bill Hoy with a derisive cheer when he was introduced. Accorsi, then a sports columnist for the Old Gold & Black, was embarrassed at the poor sportsmanship and wrote a letter to Hoy apologizing. Hoy wrote back to thank him. Accorsi stuck the letter in a textbook he was using in E. E. Folk’s journalism class. Fast-forward 50 years. Accorsi went on to a long career in the NFL as general manager of the Baltimore Colts, Cleveland Browns and New York Giants. 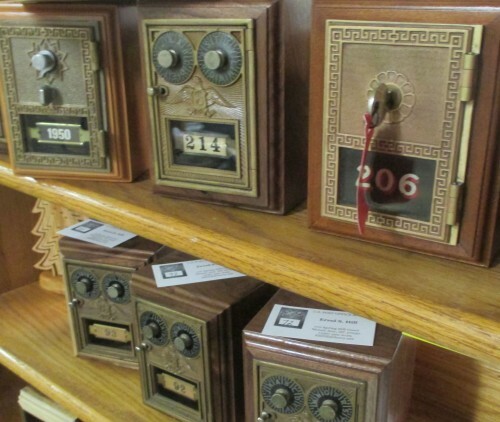 Last year, he bought one of Hill’s coin banks with his post office box door, number 7643. Even after 50 years, he still remembers that number. When a friend questioned his memory, he said, “I can prove it.” He found his textbook from E.E. Folk’s journalism class (yes, he’s saved it all these years) and pulled out the letter from Hoy addressed to box 7643. He’s since framed the envelope from Hoy. 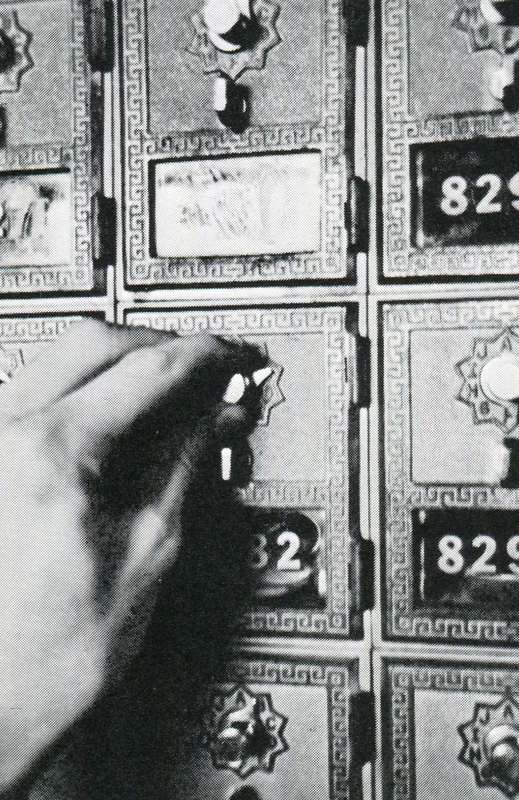 One of the old-style, combination boxes, 1967. The bank has a place of honor in Accorsi’s New York City apartment, alongside mementoes from his long NFL career, including a picture of George Halas, a Johnny Unitas jersey and NFL game balls. He only keeps things in his apartment that mean a lot to him, he said, and his post office box door brings back fond memories. It was a highlight of his week to stop by the post office after Tuesday and Thursday chapel, hoping for a letter from his mother or the sports section from the newspaper back home. 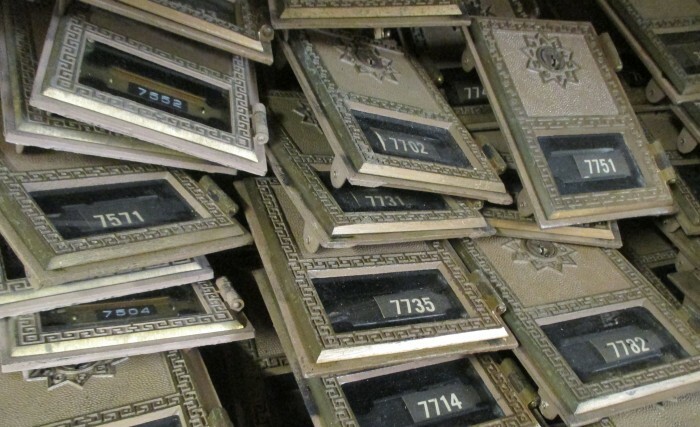 Various types of Wake Forest post office box doors.